What are all your personal records? What State Meet competitions have you been in? My records include a 39.26 300 in the 300 meter hurdles, a 48.87 split in the 4x400, and a 11.04 in the 100 meter dash. I have been to the State Meet my sophomore and junior years, bringing home a total of 5 state medals so far. 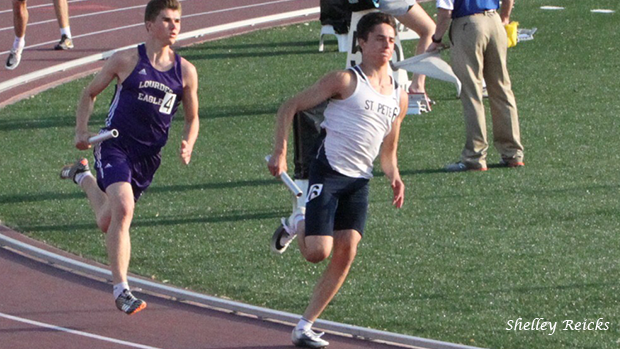 I've had a 7th-place finish in the 300 meter hurdles in 10th grade, and a 9th-place finish in the 300 hurdles junior year (due to a crash I had on the final hurdle). I was ranked second in the State going into finals my junior year. I took 3rd in the 4x400 sophomore year, and 9th junior year. Also, I took 6th-place at State in the 100 meter dash last year. I was always known as "the fast kid" when I played other sports growing up. 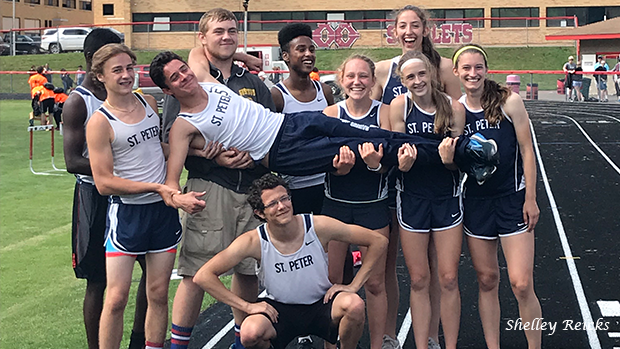 I was always excited for 7th grade so I could finally be able to participate in track and field, because there were no other track programs in my area until I got to the high school team. I immediately was bumped up to varsity once my coach saw through to my talent. I also play hockey and soccer. I was the leading scoring on my soccer team, and on a very impressive hockey team this year. My most memorable track competition was sophomore year at State. It was my goal to make it to State that whole year, even though a lot of people doubted I could do it. But when it comes to big competitions, I normally tend to shine. I PR'd by half a second to make it into State, and another half a second to make it into finals where I placed 7th. I exceeded even my own expectations, which was a pretty cool feeling. It's rare to see a 300m hurdles as good as yourself opt to run the 100m and see the type of success you've seen in that event (getting 6th at State last year). How did you start doing that double rather than the more traditional 110H/300H double? I started off doing the 110 hurdles until the beginning of last season, but my coach and I realized it was hurting my form In the 300h. I was starting to jump way over the hurdles, which was starting to put a roadblock in my performances. So my coach and I decided to start looking for a different event. I thought maybe the 100 would be a good fit, mainly thinking of it as a warm up at first for the hurdles. But the first meet I did it, I won with a 11.4. After that I set it as another goal - trying to make it to State in the one event people thought I couldn't do. I ended up PRing in the event almost every time I did it, and it became one of my favorite events by the end of the year. Who are some of your favorite athletes to compete against (either teammates or from other realms)? I loved competing against Mohamud Issack my freshman and sophomore year. He took 2nd at State in the 300 hurdles both years and acted as a positive role model to me those couple years. He gave me countless tips, and always helped build my confidence, telling me of what I could accomplish when I get older in both life and in track. Both parents (Shelley and Darwin Reicks) I would say have been a huge impact in my athletic career. Keeping my head high after disappointing performances, and making the good performances memorable. Both parents, driving countless of miles to watch me compete, missing very few of my performances. Also my coaches have had a positive affect on my athletic career. Coach Keith Hanson, for realizing my talent early, and moving me up to varsity in 7th grade to compete against better competition definitely helped improve my talent for the future years. By the time I was a freshman, I was already used to competing against that level completion and I was able to start winning many of my events. Also coach Daniel Guelle, has been an influence by pushing me hard during the season. Many times he even would run against me during practice since he was a 25-year old who used to run for Minnesota State University. He would help push me when I didn't have as much competition to run against, being from the small town of Saint Peter. Also Rachel More, was a huge impact on the offseason. She would go out of her way every week to help train me during the off season. We would train at Gustavus' indoor track before school in the winter most weeks out of the year. Supporters you may find at completions could include all my teammates, my parents grandparents, friends, and community members that follow me through the papers or know my family. What is a challenge, or challenges, you have had to face as an athlete? How have you worked to overcome it? I would say height is a big one. Many people have told me "imagine how good you would be of you were a couple inches taller". I'm currently 5 feet 9 inches, but was definitely not always that tall. Even now I still get some comments. I try to not make excuses, and accommodate for not being as tall by working out as much as I can, and doing everything I can to get better with what I am given. Just remembering to control what I can control. Also falling junior year at State when both me and many of my supporters were hoping to see me come home with a gold medal. It was tough, having to explain to everyone what happened, responding to all the texts and calls that I got after the meet wondering how it went. Seeing the picture of me falling in the paper the following week. It definitely took a toll at my confidence. But I used that stress and pain into running and lifting in the off season. I would use it to bring myself to the gym and to the track during the summer and the rest of the year. Well, being the final season in high school, there is still a lot I'd like to accomplish. I would like to win state in the 300 hurdles, and place top 3 in the 100 meter dash, and final in the 200 meter dash. I am planning on taking on the 200 this year instead of the 4x400 being the first year in my high school career that I'm not 100% confident we will be able to put together a competitive enough team. Also I would like to extend my school record from the 300H and 4x400 to the 100, 400, and 200. Leaving our senior year with a big imprint. 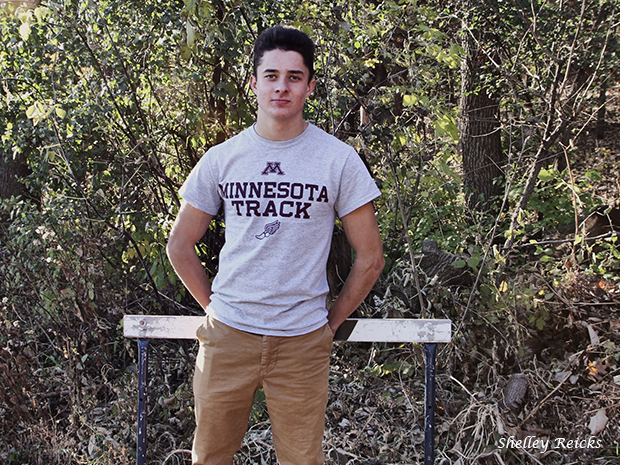 Next year I am going to run track and field at the University of Minnesota. I am big into extreme sports so you could find me doing anything that involves an extreme sport. I am also a sponsored wakeboarder. You could find me on the lake in the summer or the slopes in the winter. Do you have any specific advice or tips for the 300 hurdles that you would like to share? Remember that the 300 hurdles are 95% running. Mastering hurdles is only a small portion of the race. 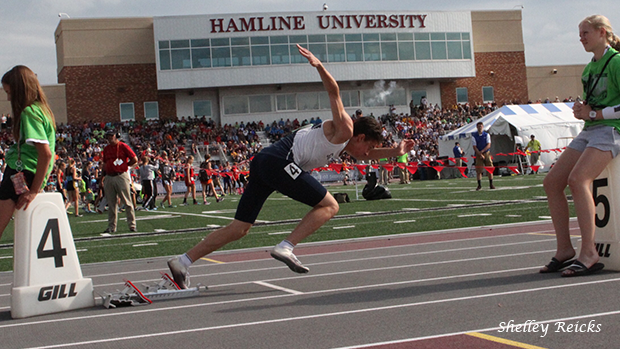 Being able to withstand a high pace for the full 300 meters is what makes a good hurdler great.